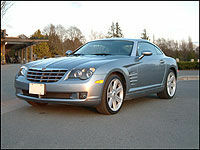 Without giving away my age, I can tell you that when I first espied the rear lines of the Chrysler Crossfire I was instantly transported back to 1965 and my favorite car of that year, the Rambler Marlin. Some 39 years ago this sleek battler of Plymouth's own fishy coupe, the Barracuda, caught everyone's attention with its 2-door boattail fastback design. The boattail design the Marlin featured narrowed as it met the rear bumper. And as with today's Crossfire, this design created wide shoulders that extended laterally over the rear wheels - not unlike a stretched version of today's Crossfire. And by the way, my passion for automobiles commenced at a very young age, so put the calculator away. Now that we have verified that history repeats itself (just come over and look in my closet sometime) let's examine Chrysler's recent dramatic entry into the sports coupe market. So move over Audi TT and Porsche Boxster, there's a new kid in town and he's as brash as an over-caffeinated news-reporter in a cheap suit. The Crossfire is the first all-new vehicle to emerge from the union between auto giants Chrysler and Mercedes-Benz, now known as DaimlerChrysler. Think of it as the first child of a new marriage. The Crossfire's DNA is 39 percent Mercedes Benz and 61 percent Chrysler - just don't ask me which auto manufacturer represents Mama and which Papa. 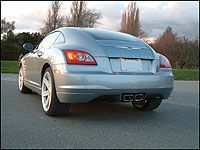 The Crossfire shares much of its chassis and running gear with the Mercedes SLK, which is a fine roadster in its own right. Therefore Chrysler's new sports car exhibits a decidedly European character, but fortunately at a decidedly American price.